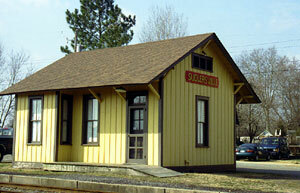 The historic Sudlersville Train Station was purchased in 1987 and restored by the Sudlersville Community Betterment Club (SCBC). This Club was established in 1916 by members of the Town of Sudlersville, Maryland, who were interested in preserving the heritage of the Town and sought to improve the quality of life for its citizens. Today, the station is a museum displaying artifacts of the Town of Sudlersville and surrounding area, railroad history and memorabilia of a notable former resident, National Baseball Hall of Fame's, Jimmie Foxx. The Train Station is located at 101 S. Linden Street.